Despite a slow but well-written second volume, R.E.B.E.L.S. rebounds in this new book, bringing to a satisfying close the series' first major storyline. R.E.B.E.L.S. : The Son and the Stars uses the scope of the large cast to create some epic-seeming battles (even if not really using each cast member themselves) and it has one of the better Blackest Night crossovers in addition to the book's swashbuckling ending. My biggest question: where can the book go from here? One aspect of recent events in the Green Lantern titles that I've really enjoyed has been the multi-front battles -- the Green Lanterns fight the Sinestro Corps, and then both groups have to fight the Red Lanterns, and then all three fall victim to the Black Lanterns. R.E.B.E.L.S. writer Tony Bedard accomplishes something similar here when the Black Lanterns interrupt a major skirmish between Vril Dox's team and Starro the Conqueror's henchmen, and watching the good guys fight the bad guys and also the other bad guys makes for frantic fun. On one hand, Bedard does well making the Blackest Night crossover seem like a sudden, unplanned event, even knocking out key members of Starro's team in the process. On the other hand, the reader certainly sees where the Black Lantern resurrection of former L.E.G.I.O.N. member Stealth, mother of Dox's son, fits into the ongoing between Dox and the so-called Brainiac 3. The best Blackest Night crossovers, I've said before, are the ones that are less about the faux resurrected hero themselves and more about what emotions or issues the resurrection generates among the living, and having Stealth around only heightens how Brainiac 3 blames Vril Dox for his mother's death. Indeed, as Brainiac 3 didn't show up in the initial R.E.B.E.L.S. volume, The Coming of Starro, at first it seemed R.E.B.E.L.S. might be "about" something else. Between Strange Companions and this volume, however, Dox's relationship with Brainiac 3 came to the forefront, never moreso than when Brainiac 3 betrays his father and defects to Starro in this book. Dox is the DC Universe's best morally-gray hero, and Bedard makes it purposefully hard to tell from one moment to the next whether Dox mourns the loss of his son, or just the loss of the use of his son's intellect as a weapon. Dox and his son have become the overriding plotline of R.E.B.E.L.S., greater than the conflict between the heroes and Starro, and it makes for fascinating, nuanced reading. In concluding the Starro storyline, Bedard evokes a feeling of classic sci-fi swashbucklers. The heroes try to make a weapon to defeat the villain; the weapon succeeds, then fails; a last-second save almost bails the heroes out of trouble; and finally it all comes down to a face-to-face showdown between Dox and Starro. There's an extent to which, as R.E.B.E.L.S. takes as its setting the cosmic elements of the DC Universe, this title and Green Lantern Corps are rather similar; at the same time, Corps has been so dark (and yet exciting) of late, while R.E.B.E.L.S. evokes the science-fiction joy of classic Buck Rogers, for instance. I'm left wondering, however, what's next? The R.E.B.E.L.S. are only such in book-name only now; the end of this story, it seems, ushers in a new era for L.E.G.I.O.N. Dox-on-the-run offered a fair enough differentiation from the aforementioned Corps, but I fear a new L.E.G.I.O.N. book would threaten to become old hat; possibly all the L.E.G.I.O.N. stories have been told the first time around (and hey, DC, where's my L.E.G.I.O.N. collections?). 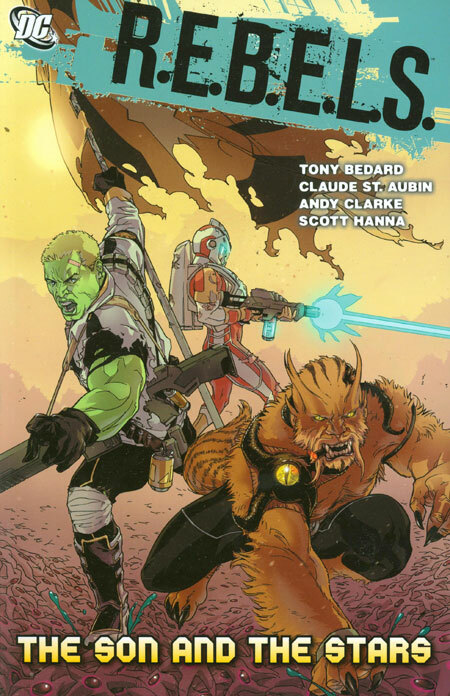 My biggest hope is that Bedard takes this turning point as a chance to cement the book's cast; even as Dox, Adam Strange, Kanjar Ro and others found the spotlight here, there's still characters like Bounder that have barely spoken. Maybe in firming up who's on the team, that will help to give the title future direction. Either way, a big thumbs up for Tony Bedard on R.E.B.E.L.S. : The Son and the Stars. As other new series have risen and fell, Bedard is three books for three on R.E.B.E.L.S., and it's a lock I'll be picking up the next book as well. This title could have very comfortably ended with this volume as the three collections make for one very complete-feeling saga. However, I am curious to see the multi-generational Brainiac conflict unfold since it was set up in Last Stand on New Krypton volume 2. Plus I'm hoping Starfire is well characterised and utilized when she joins the team - perhaps that's an aspect of the title that is lacking in comparison to the earlier incarnation with the title seeming like it should be called "Vril Dox" since the rest of the team are mostly ignored. I haven't read the end of New Krypton yet, but as I surmise it didn't follow much into the Superman: Grounded storyline that came after it, I'm glad to see at least that the new Brainiac will factor in to REBELS. Along with Starfire, I'm eager to see Lobo in an ongoing title again in REBELS. I'd have like to see Strata and Garv have stuck around as REBELS supporting cast, too. Well, as the only two vocal readers of this series CE, are you feeling bummed at today's news that this series has been cancelled? With the cancellation of this, Freedom Fighters and Doom Patrol, I'm officially suffering from Trade Waiters Completist Crisis. I want to own these series completely, but I don't know if trades are still coming. REBELS goes up to issue #20 with the next trade "Sons of Brainiac", but the final issue is #28. I'm pretty sure I'll have to get those last 8 issues from the comic shop rather than the book shop. Place your bets. I think DC will at least solicit the last REBELS trade, but the question is whether it will get enough orders to go to press. Let's hope it won't become the next "Manhunter: Face Off" or "Azrael: Killer of Saints". Gosh, I hope DC will solicit that last trade. Let's give REBELS a send-off like Gotham Central and Checkmate, and not indeed like Manhunter. Such a shame that one never came out.